Verify the basic capability to handle the 'path' element, and its data attribute (d) in combination with the straight-line path commands. Two pairs of concentric equilateral triangles are drawn using respectively M,L,Z and m,l,z. 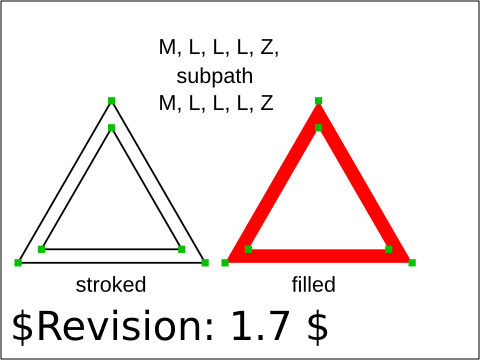 The shapes are identical, with one stroked and one filled. 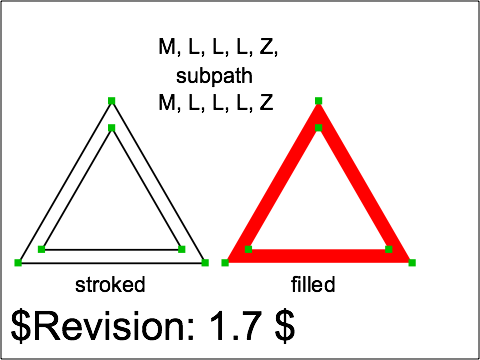 The fill-mode default of "even-odd" means that the inner triangle is hollow. The rendered picture should match the reference image exactly, except for possible variations in the labelling text (per CSS2 rules). The test uses the 'path' element, as well as basic fill (solid primary colors), stroke (black 1-pixel lines), font-family (Arial) and font-size properties.